Steven (Chicagoland, United States) on 21 February 2014 in Animal & Insect and Portfolio. Well, actually it was long before this shot that I was spotted. I went to Brezina Woods, part of the Cook County Forest Preserve District, just north of LaGrange Park, to capture some winter landscape shots after another 3"-4" snowfall. After thinking I was done photographing for the day, I got back into the car to exit Brezina Woods. When approaching the entrance, there was a herd of about six deer walking along the entrance road, which was plowed and not waist deep with snow. I put my car in park and slowly got out to take pictures. Not wanting to "spook" them with a camera flash, I turned the flash off. Seeing that their curiosity was getting the best of them and that there wasn't any fear of me or the car, I put the car in reverse and drove backwards back toward the parking lots. They continued to follow me. Knowing that I also didn't want the car to get charged at by the deer, I got out of my car and continued taking photographs and to get their attention away from the car. When I got out of the car, I realized that I accidentally left my hat and gloves inside. While out of the car with the deer, my mind kept thinking back and forth between my personal safety and keeping an eye on all of them. When they finally made their way back into the forest of the trees, I knew it was safe to get back into the car and get back home. But what an experience! Photo captured February 8, 2014. Amazing story, Steven. Wonderful you have the shots to share with us! A beautiful and rare encounter. The deer look so gentle. Easy to forget that they are in the wild. A fine shot of this deer's concentration on the camera person. It's also a great shot of animals in the snowy condition. Fabulous portraits! A fine adventure. 5 stars from me - stunning close up!!! Fabulous portrait Steven! I love how she is looking right at you. Beautiful with the snow on her face. Those are the kind of times when it is so worth being out in the elements. 5*s! Wow, very cool shot. They are gorgeous. What a great experience that must have been for you. There is just nothing like close contact with wild animals. Great capture, love its attitude. Wow! You were really close! Fantastic! I was about to type your title ! Deer are so wonderfully aware. What a beautiful capture here! Marvelous wild scene. She seems startled to see you there, for sure. Nice close up. Quelle belle histoire ! Ils n'ont pas l'air d'être effrayés. Superbe attitude ! Love the shot and the look Steven! face to face! well captures my friend! 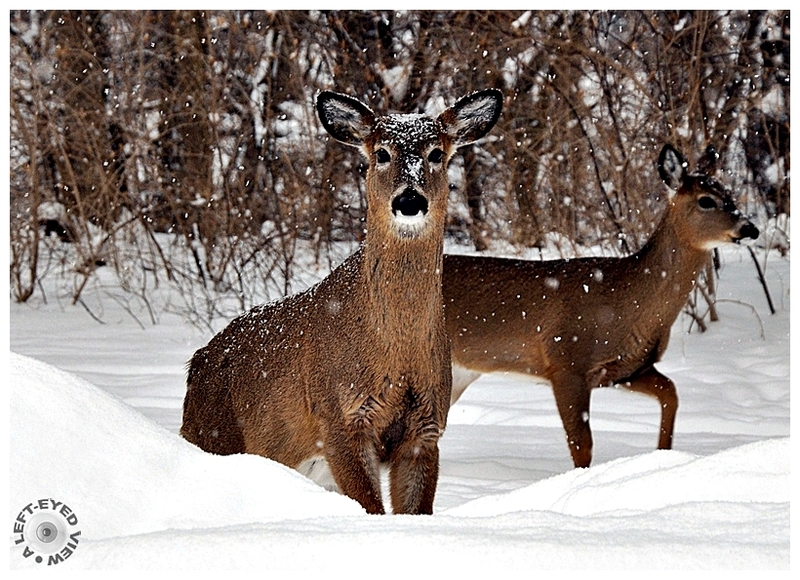 Beautifully captured … great set-up and beautiful deer in their natural setting! Nice shot with it looking right at you. Isn't it unusual for deer to follow you unless they are looking for a handout?